One good turn deserves another! 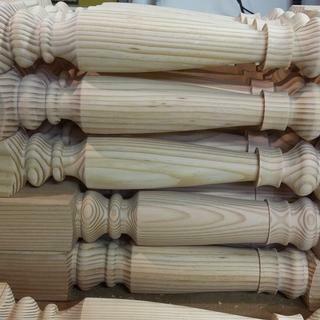 Create precise duplicates of spindles, table legs and other turned projects. 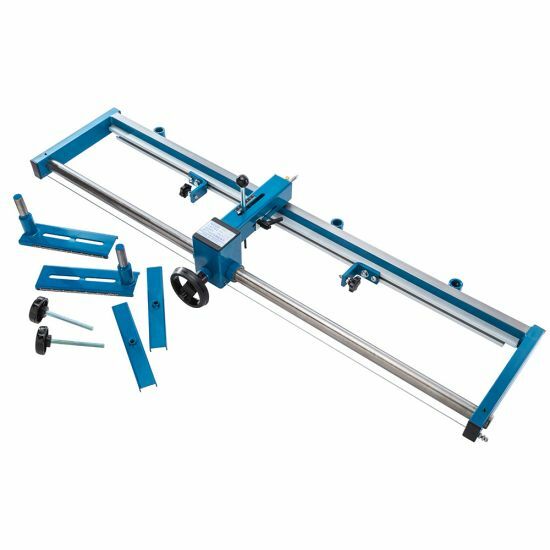 This Lathe Duplicator attaches easily to almost any floor-model lathe, and the handwheel allows for smooth operation while cutting. Maximum duplication depth-of-cut of 2-3/8"
Suitable for lathe with a turning diameter of 12" to 14"
allowing me to make full length legs. Really enjoy the duplicator. Would recommend and would buy it again. Recieved my dupilcator today. This is a very good duplicator for the money, Yes it does take some setting up, but what piece of equipment doesn't? Took me 1/2 a day to get comfortable with it, but by 7:00pm that night, I was turning out 2-3 26&quot; porch spindles per hour. All in all in my opinion, this was a good purchase, have been very pleased with all of my Rockler purchases. 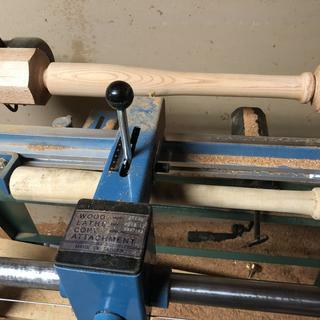 I've read all of the reviews and one thing that hasn't been mentioned is that the duplication of spindles is so precise, that I don't think that, even the pros could resist, by stating that it is so simple and easy to set up, that my grandson and my future niece will be thrilled in way these cradles have turned out. All of the 40 spindles, are exact and true to the only original one that I had left. Making these heirloom baby cradles have been very enjoyable, with the precise duplicating of the spindles. Thanks to Rockler, I have been able to make two baby cradles at the same time. It is a very good lathe accessory. But I had to buy some threaded rod to attach the duplicator to my lathe. The ones that came with it were about a half inch to short. Unit works well as it should. Some difficulty setting up, but not too much. About 3 hours. Would like the hand wheel to be a little larger with a spinner handle. Desperately needs a carbide cutter instead of the HSS cutter. HSS cutter on cedar leaves a ragged finish and requires a lot of sanding! I bought this to duplicate 34 spindles. Overall it worked, however on the 3rd spindle the clip nut stripped that locks the depth. I had to use a clamp to make sure the cutter wasn't against the wood due to spring strength. I was able to complete the spindles and they looked good. Got the basic shape but still had to do a bunch of cleanup to get a smooth spindle. Says it is for a 14" lathe but I had to add a 2" spacer to get it up to the proper height but works well after that. I used this duplicator to make over 20 oak spindles. The bit did wear out after the 10th one. I did sharpen it and finished up. I also purchased a 5/16 x 2-1/2 split solid carbide blank which if placed on a slight rotation does fine cutoff work for squaring the spindle shoulders. The spindles had two beads separated by a balloon. They had a dia. Of 2.5 inches and a taper on both ends. Set up is a challange but, once you have it set up the end results are very good. It is worth the money. I wish the cutting tip lasted longer so, I would recomend buying one or two spares. This duplicator has made my wood working life so much easier. I bought this duplicator several years ago, and ended up leaving it unopened on a shelf. 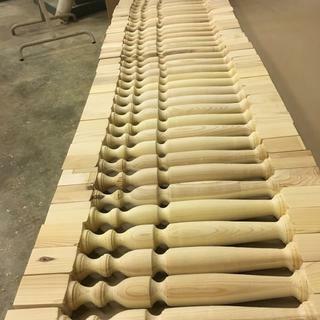 Recently had a need to make multiple turned and carved balusters, and decided a duplicator was necessary for the top 14&quot; section. The manufacturer claims this is intended for a 14&quot; lathe, but it needed 5/8&quot; - 3/4&quot; risers between the bed and mount to fit a lathe that size. I've never seen a consumer duplicator yet that left a smooth finish or can copy a steep parting cut. This was no exception. However, precise parting cuts can easily be made when roughing out the blank before using the duplicator, and it takes very little effort to sand out the minor ridges and irregularities left in the finished work. With one hand on the lever controlling depth of cut, and the other on the wheel guiding movement side to side, the user has ample control of the cutting tool. For the price, it is a good duplicator for occasional use and a worthwhile addition to the shop. Worth noting: the duplicator is supported by sleeves that drop down onto posts. One of the sleeves on mine was not plumb, which forces the mount to not sit flat on the lathe bed -- easy to fix when making a riser block, but an annoyance anyhow. Easy to setup, well thought out. I like the duplicator it works well enough, the cutting head tears the wood but that's ok because the duplicating pin leaves the piece you are turning a little large which gave me the opportunity to use my spindle gauge to do a finish cut that left me with very little sanding. The instructions are for the birds, hard to understand and very poorly written. I winged it and I think it went faster any. It's well built and think it will last. Set up wasn't too bad but directions need to be better, the cutter has dulled and there is no instructions for sharpening. If it can't be sharpened they should at least offer it in carbide. One problem is if you lean on the duplicator in any way it changes the geometry and cuts off. I've been using it to make the long section of a candle stick and it tends to be rough and as noted it can't make fine detail cuts. One trick is to rough out the piece before going to the duplicator which saves a great deal of time. As stated in several of the other reviews, you get what you pay for. It is a good duplicator for the money but certainly not great. But you can always clean up the sharp and deep transitions with hand tools afterward. Two major complaints:1) There is CONSIDERABLE slop in the cutter control rod in that it rotates depending on the direction you are going. This makes fine details very difficult to duplicate. This can be fixed somewhat with a custom bushing around the control shaft to hold it in the slot. But it is an annoyance and more of a problem when turning hard woods.2) Setting the cutting depth is VERY DIFFICULT, can easily slip during adjustment, and damage the part - so BE CAREFUL. An improvement would be to some kind of screw adjustment to the control rod.Otherwise, the unit is OK. It is heavy making set-up something of a battle. But once set, it does make pretty good parts as long as you pay attention to the slop in the cutter control and are comfortable doing the fine finish work by hand. I have left a review earlier. However, seeing the reviews above I felt I should make another comment. With any machine it requires some setting up. I had to do some work to make it fit my lathe, and align the cutter in the best position. 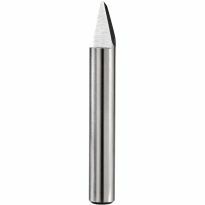 The cutter is a bull nose profile, if you require more fine detail it will need to be re-ground. To this end spare cutters should be purchased. The guide wire did need to be tightened this was an easy job. This type of wire will stretch if left under tension. You have two choices. 1) slacken the thing, or 2) re-tension if it stretches.An item such as this cannot be used straight from the box it will need to be set up. It is fairly heavy so be careful when handling it. I use mine for making legs for Rocking Horse Stands among other things. As always Rockler services is excellent!As far as this duplicator is concerned I agree with the other reviewers. It is a pain in the @!#$! to use. I found myself just ignoring the wheel and sliding the unit along the stock by hand. I found that it is critical that you do not advance the stop screw more than a fraction of an inch per pass or you will get bad tear out! I found this out on some red birch legs I was turning. As far as the final finish is concerned I was able to clean up my turnings with a scraper afterwards which saved me a lot of time on sanding. All in all this duplicator is ok for occasional light and I stress both occasional and light work. Definitely not a production machine. Also another point to mention, Do Not over tighten the cutter set screw. 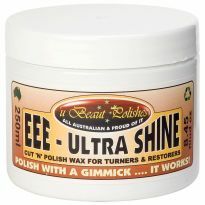 It is soft brass and will strip very easily. It was fine and set up wasn’t so bad, but this will not work for replicating small detail work. We tried to tweak it to produce better copies of the small spindles we were making, but it would not dial in close enough. Might work for larger spindles. I had to make some custom brackets for it to be mounted to the bed. The plastic lock handle was broken when I opened the box. 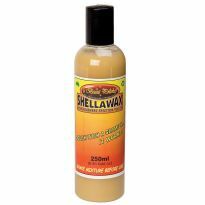 It took a long time to figure out the particulars of the product and how it reacted with what I was trying to copy. 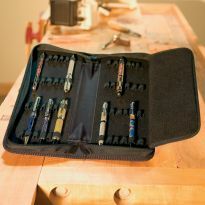 It is not for high production just suitable for four legs if you want to copy for some individual projects. It is not fast you have to take your time. Conceptually it is designed well and works well but it is missing something to make it a little better. It was a bit too expensive for what it can do. The direction are poor at best. The cutter is too low when working on thin stock (1.5in square. It's going to take me some time to get use to using it. Once I get the hang of it, it should be fine. New item for our local High School Shop Class. seemed to be simple to use. I would think again about being charged for shipping TWICE when on top of the add it states free shipping on orders of $35.00 or more. ratings were good and looks well built. Needed to copy old spindles. Going to try and modify on a metal lathe to do the work. Thought it looked like the best for the money. I need a duplicator to copy small spindles(40) for a woodturning project. To reproduce spindles for staircase. Hopefully more jobs in the future. It looks as if it will meet my needs. wanted to duplicate some fancy spindles. Will this fit a Central Machinery lathe from Harbor Freights, 12"x 36"? How to set up duplicator in different size lathes? to get the cutter height correct to the centerline of the lathe? Will it work on an old Style Rockwell lathe? Would this work with the jet 1221vs lathe with a bed extension? 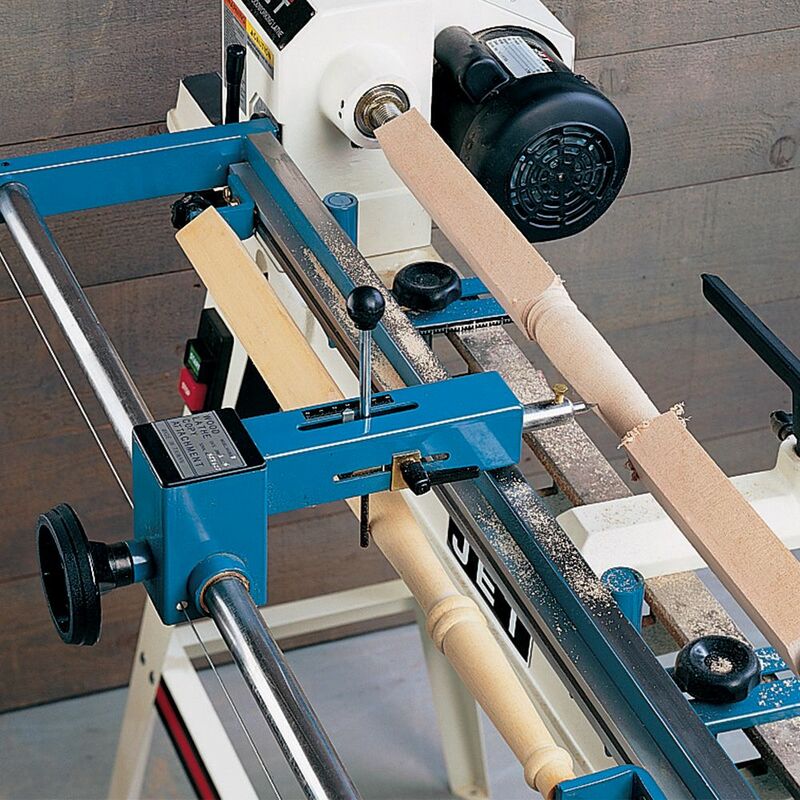 What is the proper height of the cutter to the center line of the lathe? Will it work on shopsmith? BEST ANSWER: I'm not sure that the lathe duplicator will work on the Shopsmith because of how it mounts to the bed (or rails in the shopsmiths case). In the photos you can see there are two knobs that bolt through the bed. Those mounts allow you to move the duplicator in and out to adjust for the diameter of the piece your turning, they are also set so that the tool at the center of the work piece on 12" diameter lathes. It might be worth reading through the manual under Technical Specs (page 3) has some pictures of the mounting setup. Is there any duplicator out there that fits on a Excelsior mini lathe with extension bed ? BEST ANSWER: I put mine on and older craftsman lathe with tube type rails had to make some minor alterations but worked great. will duplicator work with a jet 1442 lathe? BEST ANSWER: The duplicator will work with any lathe. The issue is you may have to do some minor mods to the mounting brackets to make it work for your machine. It is not made for universal mounting but, hey, we are all woodworkers always making jigs and mods to make other things work. 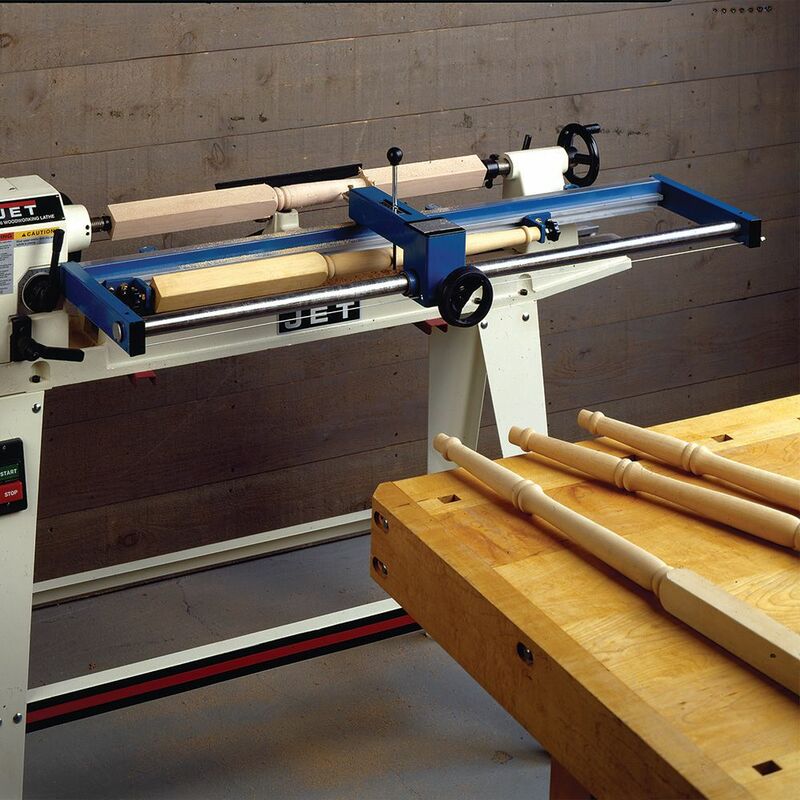 I believe that the Lathe Duplicator will work with the Jet 1442, but it will only duplicate work up to 39" in length. Yes, it should mount right on to your lathe. will this duplicator work on a craftsman 12 inch? I'm not sure about the mounting. Will it work on jet 1220? BEST ANSWER: I do not know. I have a Harbor Fright 36" lathe and it works great on it. If you get the bed extension (I think it is the Jet BE-20, but you might have to double check) it should work. The duplicator is designed to bolt onto any 12" or 14" diameter lathe. If you look at the picture of the duplicator you'll notice that it is just shy of 4 ft long The mounting brackets are at set spacing, you will need the bed extension to have room for the tailstock. I looked at a picture of a 1220. It looks like it will work, however you may want to check the two bed mounting points on the duplicator to make sure your bed is long enough to accept it. Also, it appears the drive motor is mounted directly under the bed so make sure you can get your bracket between the motor and the bed. I purchased this duplicator for a Jet JWL-1236 - only one that seems to work with my lathe. Will this work on a 9"x30" lathe? Probably, but they do suggest more like 12-14" throw than 9" If you are just planning to duplicate spindles up to say 4" , you should be fine. WILL THIS FIT/WORK ON A DELTA 46-700 MODEL LATHE? The distance from the spindal to the bed is 7 - 8 inches. It should fit, I have a delta 1442 and it worked well. Will this fit my 1980s shop smith? BEST ANSWER: In reviewing the Shop Smith Lathes, it appears that this may very well fit your lathe with either no or very little modifications! The one thing that I see that may cause some issues is that on the Shop Smith Lathes, it appears that they use two round bars to slide the head back and forth on. You may need to create some type of a mechanical stop to keep the duplicator from walking on the bars. I found this item to be fairly universal. It didn't fit my lathe either so i made brackets for it and it works as intended. I bought one used. Where can I get a manual? BEST ANSWER: The Manual is on Rockler's Webpage. Scroll down the lathe duplicator page and there is a link under to "Technical Downloads." Had to download off the Internet. Can this be used with the Nova Comet ll ? BEST ANSWER: I do not know. 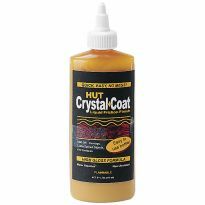 I used it with a harbor freight lathe very effectivly with no adjustments. Very versitile! Can someone with some knowledge just give me a call so I can ask several questions ASAP? 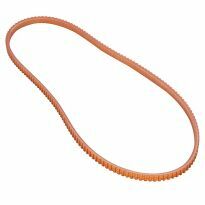 BEST ANSWER: I purchased this item to make stair railing spindles. Can I help with any questions? Not sure, but it is worth calling to ask. How much can you take off at one time. Will it work to make a baseball bat ? BEST ANSWER: Two things: 1) this is for general sizing only, it doesn't take off much at a time 2) You still have to do some sort of finish cut as well as sanding. 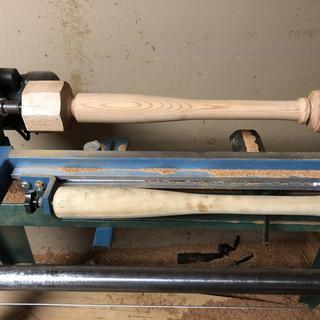 For something as simple as a baseball bat I do not think it is worth the effort and cost. Will this work on a Powermatic 3520B? will this work on a Lanova 18/36 lathe? BEST ANSWER: Yes.ive used it on a HF lathe and a Laguna 18/36. Its adjusts to fit. I'm not sure. I have it on a Harbor freight lathe. It has an opening between the frame, a couple inches. Just put the lags through the frame, turn cross ways, an tighten. It works great for me but I am retired and that's my hobby, wood working. I recently purchased a NOVA 46000 Comet II 12 Inch by 16 1/2-Inch Variable Speed Midi Lathe with a 23" bed extender attachment. Will this duplicator work with this lathe? It should mount right up. Will this duplicator fit a delta midi-lathe 46-460? Does this duplicator work with a this specific lathe: JET JWL-1642-2EVS, 16"x42"EVS PRO? I think it will work on any lathe with an opening the length of the bed. Most have an open bed for moving the tail stock. I have one on a Central Machinery, and it works great. I think you will like it also. Can anyone tell me if it works with a Jet 1014VSI with a bed extender on it; and if not, are there easy modifications that would fix any known issues? Thank you. BEST ANSWER: It should bolt onto the bed with out a problem, BUT the cutting tool will be an inch too high (since it is designed to fit a 12" lathe). I had to cut an inch off of the bottom of the fixed tubes that are welded to the Main Frame. You loose a set screw but the cutting tool is lined up with the center. It appears your lathe can turn a 10" diameter and the duplicator can fit a 12 to 14 inch lathe. When I mounted it on my 14" lathe it was way to low to the bed, we had to block it up. So, I imagine it would work with your lathe. I would expect there is still some mod work you may have to do. I have a JET 1220VS lathe complete with bed extension, will the duplicator be suitable for use with this machine ? BEST ANSWER: It did not fit my Grizzly 16' swing lathe as it was too low for the swing. I had to put 1.5' blocks to raise its height to center line. It was not hard to do, just took some thinking. I really found the handle to move it to be almost useless unless a very light cut was taken but I could just push it instead. I am making dining table chairs with lots of spindles and other than those problems, I have found it to be worth the buy. I believe it will work. The cutter is minimum 6 1/8" above the bed which should be on center. There are 3 fixed brackets with approx 38" between the outer 2. The picture on the web shows the outer bracket not being used. The tail stock can be placed between the brackets for shorter work. will it fit a Laguna 18 - 36 ? BEST ANSWER: Not sure. I use it on a Delta Mini lathe. Had to modify slightly but works fine. Will this work on a grizzly 10x18? Will it work on a record power dml63sh? Will this duplicate baseball bats? BEST ANSWER: Yes, As long as they are not longer then 39". I personally have not made any bats. But if you had a template of what you wanted the bat to look like I sure it would. I see from the answers that a user said it "might" work on the JET 1220VS lathe. Please, has the enquirer tried it and did it work? Anxiously awaiting reply before I buy. Roger. BEST ANSWER: I am not 100% sure the device will fit your your lathe, however; I can say with complete confidence that this device fits my Central Machinery lathe (Jet knock off) with no issues. It works as promised as long as the operator makes shallow passes. I had to order a replacement handle because I used too much torque. That's the only issue I encountered.